The Rainbow Warrior was the flag ship of the Greenpeace movement, when it was sunk by agents of the French Foreign Intelligence, while anchored in Auckland harbour, on the 10th of July 1985. In this story thirteen-year-old Rowan Webb gets herself a French penpal and unwittingly b... read full description below. 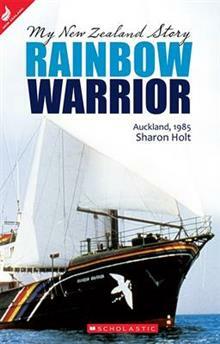 The Rainbow Warrior was the flag ship of the Greenpeace movement, when it was sunk by agents of the French Foreign Intelligence, while anchored in Auckland harbour, on the 10th of July 1985. In this story thirteen-year-old Rowan Webb gets herself a French penpal and unwittingly becomes involved in an event that not only shocks a nation, but the whole world. Includes historical notes.